On February 12, 1962, Constable John Frederick Nash pulled over a motorist wanted for armed robbery. The driver was heavily armed at the time of the stop. As Constable Nash approached the car, the suspect got out and shot the officer, causing him to fall to the ground. The suspect then stood over the officer and fired three more shots at him. 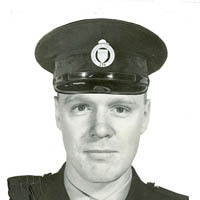 Constable Nash managed to remove his service revolver and fire twice, hitting the suspect in the arms and neck. Responding officers arrested the suspect as he tried to flee in his car. Constable Nash died later in hospital.